"I grew up in the Canal Zone and sancocho is a must for large family meals. 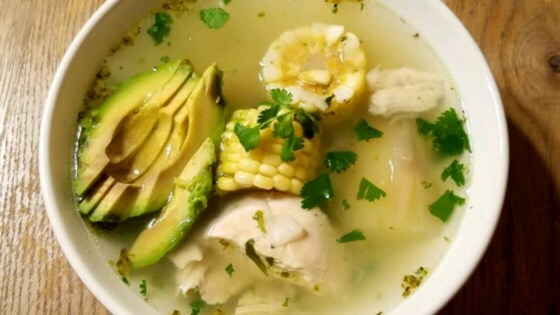 Sancocho is a Latin chicken soup with cilantro and yuca (or cassava). Keep in mind, there are a variety of recipes out there this is just the one my nanny used to make us." Combine water, chicken, plantains, onion, cilantro, garlic, and salt in a large pot. Bring to a boil. Reduce heat to medium; cook until chicken is longer pink at the bone and the juices run clear, about 45 minutes. An instant-read thermometer inserted into the thickest part of the thigh, near the bone should read 165 degrees F (74 degrees C). Remove the chicken and let cool. Add yuca, potatoes, and corn to the soup; cook over medium heat until yuca and potatoes are softened, about 30 minutes. Discard chicken skin and bones. Place meat back into the soup; stir to combine. For those families like mine who don't eat leftovers, just turn them into Latin Chicken Pot Pie. 1. Drain sancocho broth and freeze for other chicken recipes (rice, soups, etc). 2. Combine leftover chicken-yuca-potato mixture with a can of condensed cream of mushroom soup. 3. Scoop mixture into a 9-inch unbaked pie crust. Seal with another unbaked pie crust and cut 4 small slits at the top. 4. Bake for about 40 minutes at 425 degrees F (218 degrees C). Leftover chicken skin, fat and bones make amazing frozen chicken stock. Just heat 6 cups water, leftover chicken, 3 stalks celery, 2 carrots, 1 onion (halved), bouillon cube, and 1 bay leaf for 3 hours. Freeze and use for other recipes. I also lived in the Canal Zone as a child. I haven't had any Panamanian food since my mom passed. I can't wait to try this. Thanks for the recipe. I in from Colon, so I love sancocho. Thanks for this recipe.